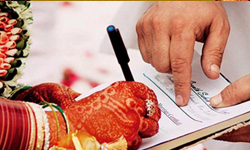 Marriage is solemnized in the Arya Samaj Mandir and the same is registered under section 8 of the Hindu Marriage Act-1954 by the Registrar of Marriage appointed by the Delhi Govt. on the same working day without giving any notice to the parents of the parties. 1. Documentary evidence of date of birth of parties (Matriculation Certificate / Passport / Birth Certificate/ Driving License). Minimum age of both parties is 21 years for male and 18 years for female, at the time of Solemnization of Marriage in Arya Samaj Mandir. 2. Election Card and Aadhar Card of the boy and girl. 4. Twelve each passport size photographs of both the parties. 5. Total two witnesses from any side along with their 4 each Passport size photographs, PAN Card and Identity Proofs. 6. 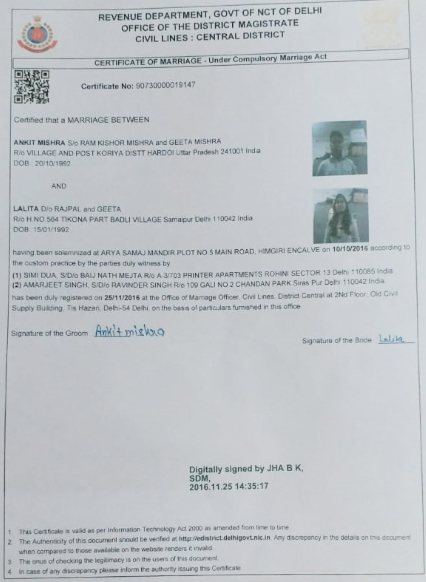 Affirmation in the affidavit that the parties are not related to each other within the prohibited degree of relationship. Meaning thereby they are not blood related. 7. Copy of divorce decree/order in case of a divorcee and death certificate of spouse in case of widow/widower. 8. Two garlands, two kg. Sweets and half kg. desi ghee. 9. In case one of the party is of foreigner, a copy of no objection from the concerned embassy regarding his/her marital status. Chamber No. B-145, Bawa Gurcharan Singh Block, Near Gate No. 3, Tis Hazari Court, Delhi-110054. Note: Please visit only after taking prior appointment for meeting. 30 days' notice is given in the presence of both the parties and thereafter in the presence of three witnesses marriage is directly solemnized by the Registrar of Marriage appointed by the Delhi Govt. 1 - Documentary evidence of the date of birth of parties (Matriculation Certificate / Passport / Birth Certificate/ Driving License). Minimum age of both parties is 21 years for male and 18 years for female, at the time of Solemnization of Marriage in the Arya Samaj Mandir. 2 - Election Card and Aadhar Card of the boy and girl. 4 - Ten each passport size photographs of both the parties. 5 - Total two witnesses from any side along with their 4 each Passport size photographs, PAN Card, Voter Card, and Aadhar Card. 6 - Affirmation in the affidavit that the parties are not related to each other within the prohibited degree of relationship. Meaning thereby they are not blood-related. 7 - The copy of divorce decree/order in case of a divorcee and death certificate of spouse in case of widow/widower. 8 - Two garlands, two kg. Sweets and a half kg. desi ghee. 9 - In case one of the party is a foreigner, a copy of no objection from the concerned embassy regarding his/her marital status. For solemnization of marriage under the Special Marriage Act-1954, the presence of both parties is required twice once at the acceptance of notice and second at the solemnization of marriage after 30 days time period. 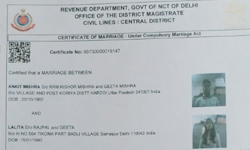 A copy of the notice is displayed on the notice board of Registrar of Marriage appointed by the Delhi Government. Any person within 30 days of issue of notice may file an objection to the intended marriage. In such a case, the Marriage Officer shall not solemnize the marriage (between 9.30 to 1 pm) until he has decided the objection first, within 30 days of its receipt. 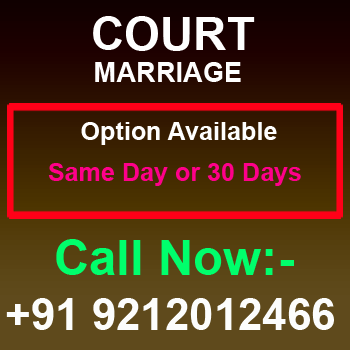 In case no objection is received, the Marriage Officer will solemnize the marriage as per law. Both parties along with 3 witnesses are required to be present on the date of solemnization of marriage. It is advisable to bring all the originals at the time of appearance before the Registrar of marriage. 1. Documentary evidence of date of birth of parties (Matriculation Certificate / Passport / Birth Certificate/ Driving License). Minimum age of both parties is 21 years for male and 18 years for the female. 4. Four each passport size photographs of both the parties. 5. Total three witnesses from any side along with their PAN Card, Voter Card and Aadhar Card. 6. Affirmation in the affidavit that the parties are not related to each other within the prohibited degree of relationship. Meaning thereby they not in blood relation. 8. In case one of the party is of a foreigner, a copy of no objection from the concerned embassy regarding his/her marital status. 1. Documentary evidence of date of birth of parties (Matriculation Certificate / Passport / Birth Certificate/ Driving License). Minimum age of both parties is 21 years for male and 18 years for female. 5.Total three witnesses from any side along with their Pan Card, Voter Card and Aadhar Card. 8. In case one of the party is of foreigner, a copy of no objection from the concerned embassy regarding his/her marital status. 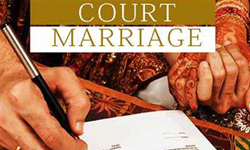 Court Marriage Certificate is a document providing social security, self-confidence particularly among married Women claiming legal right from court of law. Court Marriage Certificate is useful in getting the spouse visa from FRRO or from any embassy situated in New Delhi or any other place in India. Court Marriage Certificate is helpful in claiming the rights of the legal heirs of Bank deposits or Life Insurance benefits when the Insurer dies without a nominee or otherwise.